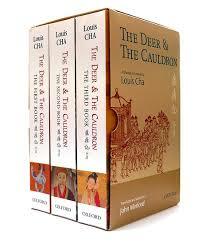 The Deer and the Cauldron was written between 1969 and 1972, and was the last of the long and enormously popular series of martial arts novels written by Louis Cha, or Jin Yong as he known in Mandarin Chinese, Gam Yong in Cantonese, a prominent Hong Kong public figure, millionaire, charismatic story-teller and icon of Chinese popular culture, who built his media empire on the runaway popularity of the early serialisation of his novels. Cha, born in 1924 into an old and distinguished family from Ningbo in central China, is the acknowledged modern master of the uniquely Chinese genre known as martial arts fiction (武俠小說), which has its roots in a grand old picaresque tradition going back in China to the tenth century and earlier, a medieval genre that included such masterpieces as the classic outlaw novel All Men Are Brothers (水滸傳), otherwise known as Outlaws of The Marsh, still popular with Chinese readers today. A complete set of Cha’s novels runs to thirty-six volumes, and in their original language they have sold hundreds of millions of copies throughout the Chinese-speaking world and have been adapted into countless movies, cartoons, operas, TV-series and video games. For a long time banned as decadent and frivolous in Mainland China, for the past 30 years or so they have become enormously popular with Mainland readers too, and were among the favourite reading matter of statesmen such as paramount leader Deng Xiaoping (鄧小平, 1904-1997) and Jiang Zemin (江澤民 born 1926, President of China 1993-2003, a personal friend of Cha’s). His addictive story-telling style, combining fluent traditional Chinese prose narrative with a vividly modern cinematic touch, his fertile imagination and magical ability to transform Chinese history and culture into swash-buckling romance, together with his prodigious output over the years, have often caused him to be compared to the great Alexandre Dumas père, prolific author of The Three Musketeers and many other historical romances. Cha’s own Western name, Louis, was inspired by his admiration for that other great story-teller Robert Louis Stevenson. Cha laces his own stories with frequent references to the supernatural, and to Chinese martial arts practices, gripping his readers with action-packed scenes involving complex and sometimes extreme kungfu moves. He creates endlessly evolving and intricate plots, packed with intrigue, and always keeps his Chinese readers craving more, longing for the next instalment. He has inherited the role of the old-style street performer in the Chinese marketplace, and built his considerable fortune on his instinctive skill as a popular storyteller. But The Deer and the Cauldron is above all a wonderful romp. In many ways it brings to mind the spoof-historical novels of George Macdonald Fraser (1925-2008), which feature that archetypal cad Flashman. It is closer to works such as Flashman and the Dragon, or Flashman in the Great Game, than it is to the old-fashioned romances of Walter Scott and Alexandre Dumas. The plot of The Deer and the Cauldron is set in the mid-seventeenth century, shortly after the Manchu conquest of China, during the reign of the second, and perhaps greatest, Manchu Emperor, known by the reign-title Kangxi (康熙), sometimes referred to as China’s Louis XIV. His long reign lasted from 1661 to 1722. At the beginning of the novel, the Manchus have been ruling China for a little over twenty years, and are gradually, and ruthlessly, managing to extinguish the last residual sparks of the Chinese Resistance, in the South and the Southwest. The prologue, which was written during the height of the early excesses of the disastrous Cultural Revolution in Mainland China, echoes some of the political cut and thrust of that so-called revolution, in reality a bloody holocaust, details of which would have been fresh in the minds of Cha’s readers. The prologue describes in gruesome detail the persecution of Loyalist intellectuals during the 1660s. Readers impatient for a taste of the kungfu low life that permeates most of the book have to wait until the first chapter. On the Dragon Throne at the opening of the novel is the young Emperor Kangxi, one of the grandest monarchs in the whole of Chinese history. Principal among the underground organisations fighting Manchu rule is the newly formed Triad Secret Society, and in the pages of The Deer and the Cauldron we encounter many a colourful Triad member, including - as I call them in my translation - Big Beaver, Scarface Jia, Goatee Wu, Baldy Wang and Squinty Cui. The novel weaves its way through a host of historical events, painting a broad picture of the Chinese political landscape, culminating, at the end of the third volume, in the Treaty of Nerchinsk, signed between China and Russia in the year 1689. Trinket somehow manages to have a finger in every available pie, and along the way assembles a veritable harem of beautiful women. Finally after a lifetime of relentless palace intrigue and endless kungfu adventures, having survived many a dangerous encounter with the palace impostor masquerading as the Dowager Empress - Trinket simply calls her the Old Whore - and having come up against the sinister and fanatical underground sect, the Mystic Dragons, based on Snake Island, with their powerful mantra-based kungfu, after a series of colourful love-affairs, one with the beautiful Chen Yuanyuan, known as the Peerless Consort, another with the glamorous Russian Princess Sophia, Trinket finally decides that he’s had enough; it’s time to quit, and he returns with his many wives to Yangzhou, his old home in the south: “opting for a life of simple pleasure, his ultimate destiny shrouded in mystery.” He builds out of his multiple identities an absorbing and extraordinary card-castle of a life. It is his mercurial personality above all that turns the book into what the distinguished Hong Kong critic Stephen Soong has called: “a roller-coaster of a novel, packed with thrills, with fun, rage, humour, and abuse, written in a style that flows and flashes like quicksilver.” An anonymous reader remarks on one of the countless Cha websites, that Trinket is the kind of friend who would have had not the slightest qualm about helping himself to your money and then your wife. Translating and indeed adapting and interpreting The Deer and the Cauldron for a foreign audience is to a very large extent about how to represent this obnoxious brat in English. Cha himself, at the official launch of the first volume of the translation in Hong Kong, pointedly disowned Trinket. On this point I ventured to disagree with him. He also took exception to the way we abridged his work, from five volumes to three. This abridgement had in fact been deemed necessary by my silent collaborator in the project, my father-in-law David Hawkes. He translated half of the chapters, but did not wish his name to be put on the books. The French sinologist and translator Jacques Pimpaneau had proposed the same approach to Cha many years earlier, when discussing a possible French version. Now that the globe is becoming progressively more and more fascinated by the phenomenon of China, it is high time for this hilarious tale, this rattling yarn, to be made accessible to the English-speaking world, offering them a taste of true Chinese popular culture. Details: The Deer and the Cauldron is published in a three-volume box set, by Oxford University Press, priced in local currencies.